Stems still attached to their parent plants may form roots where they touch a rooting medium. Severed from the parent plant, the rooted stem becomes a new plant. This method of vegetative propagation, called layering, promotes a high success rate because it prevents the water stress and carbohydrate shortage that plague cuttings. Some plants layer themselves naturally, but sometimes plant propagators assist the process. Layering is enhanced by wounding one side of the stem or by bending it very sharply. The rooting medium should always provide aeration and a constant supply of moisture. Tip Layering Tip Layering Dig a hole 3 to 4 inches deep. Insert the shoot tip and cover it with soil. The tip grows downward first, then bends sharply and grows upward. Roots form at the bend, and the recurved tip becomes a new plant. 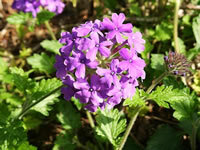 Remove the tip layer and plant it in the early spring or late fall. Examples: purple and black raspberries, trailing blackberries. Simple Layering New plants can also be produced by simple layering. Pin a low growing stem to the ground, using a piece of stiff wire bent into a U, leaving the last 6 to 12 inches of the stem exposed. Cover the pinned area with soil, then bend the tip sharply into a vertical position and nick the bark on the underside of the bend. Provide a stake to hold it in place. 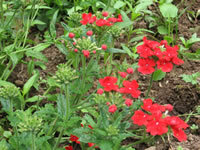 Once the layer is well rooted, it can be severed from the parent and moved to another part of the garden. Examples: rhododendron, honeysuckle. Compound Layering Compound Layering This method works for plants with flexible stems. Bend the stem to the rooting medium as for simple layering, but alternately cover and expose stem sections. Wound the lower side of the stem sections to be covered. Examples: heart-leaf philodendron, pothos.